All of the items below are affiliate links. If you’ve been dreaming about freeing up your hands while playing your instrument, your dream has finally come true! 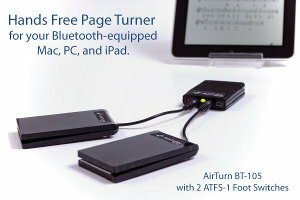 Together with NextPage, the BT-105 Wireless Page Turner from AirTurn now makes it possible for you to page forward and backwards using foot pedals. 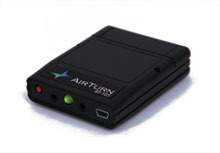 The BT-105 communicates to your iPad over Bluetooth, giving you simple setup and reliable operation. The internal rechargeable battery is good for approximately 100 hours of standby usage before it needs recharging. A mini-USB charging cable is included. I use it regularly, and I trust it completely. 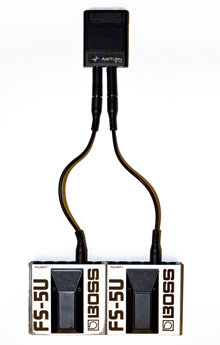 If you stand to play, you may prefer these more traditional guitar-style foot switches to the ATFS-1. They are not completely silent, but they’re built like tanks. They also clip together, making it easy to keep track of them during busy performances. This is the iPad stylus I’m currently using. I don’t like extra things to keep track of, but sometimes your finger is too blunt of an object for marking music! The World’s Most Awesome Clarinet Stand! This is the high-tech version of a clarinet stand. If James Bond played the clarinet, this would be the stand he’d be using. Made in Germany, the stand is very well made and just plain fun to set up and put away. The feet are metal and create a very wide solid base for your instrument. To store it, unscrew the base, fold up the feet and then insert them back into the base and screw it tight. Very cool and very functional.